Quite fast, based in large part on the gorgeous, and record breaking de Havilland Comet, it is of course the “wooden wonder” made of plywood and powered by two Merlin V-12 engines. 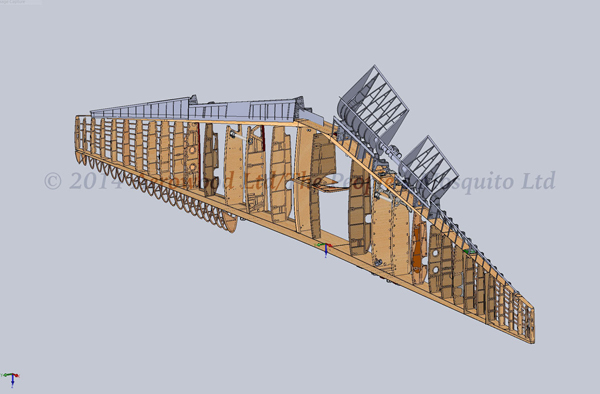 And it is wood that we are writing about today since the latest post from TPM announces the cutting of the wooden wing ribs for ship RL249, The People’s Mosquito! Canadian Spruce was the wood of choice in World War II and it remains so today. Computer aided cutting makes for faster work with even more precision — though precision back in the day was measured in the very low hundredths of an inch or even less. The ribs will support a wing nearly 50 feet in span as well as a fuselage and a pair of Merlin engines. Corin McCrae (Aerowood Ltd/Auckland NZ) will be overseeing the all important cutting — important for flight and significant for its physical symbol of the RL249 taking form. £50,000 is the cost of this phase and The People’s Mosquito Ltd. has announced some fun to go with the fundraising which can be seen here. More information is sure to follow so please stay on alert as well as consider donating to the only publicly based flying Mosquito project in the World and to have one fly in the UK — until that happy days occur it is like not seeing North American P-51 Mustangs flying in the USA! Thank you, Joe! Thank you!! More later, when I’ve fully woken up……………….